An ex-NDP staffer also noted alcohol is used as "a tool to make women vulnerable." 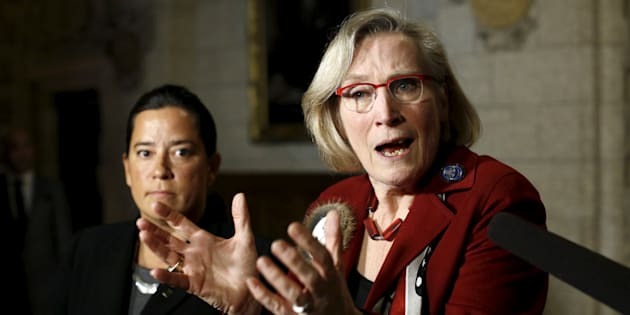 Carolyn Bennett speaks during a news conference on Parliament Hill on Jan. 26, 2016, as Justice Minister Jody Wilson-Raybould looks on. OTTAWA — MPs on the cocktail circuit must be cautious about alcohol consumption as Parliament Hill looks to put an end to inappropriate behaviour and tackle sexual misconduct, says Crown-Indigenous Relations Minister Carolyn Bennett. So, too, should political staff members, adds a woman who once worked for the federal New Democrats. Bennett, who has spent more than 20 years as a Liberal MP, said parliamentarians of all stripes are frequently engaging with other politicians and staff, adding every effort must be made to clean up the culture of the institution. "We should set the highest possible standards for ourselves in order to be able to demonstrate the culture of the House of Commons ... is an example that all other institutions should emulate," she said in an interview. Bennett, who was part of a special Commons committee that worked during the last Parliament on a code of conduct designed to prevent sexual misconduct among MPs, said Members of Parliament are, in many respects, working all the time and need to be extra careful about their behaviour. "You wouldn't have a drink before you go to a really important meeting," she said. "I think there is obviously truly social events but then a lot of events that take place on the Hill ... I don't think people should have too much to drink at those events." But a bigger issue than MPs drinking too much is the use of alcohol by men to make their intended targets more pliable, says former NDP staffer Lauren Dobson-Hughes, who alleges she faced routine sexual misconduct in her seven years on the Hill. "The only way I'm interested in talking about alcohol and assault is how men push it on women, using it as a tool to make women vulnerable," she wrote Friday on Twitter. Alcohol was a factor that led to sexual misconduct allegations levelled against Patrick Brown, who resigned Thursday as leader of the Ontario Progressive Conservatives just months before a provincial election. Two women, interviewed by CTV News but not identified, alleged Brown made sexual advances on them while he was a federal politician, after the women had been drinking. The women said Brown, who has categorically denied the allegations, had not been drinking at the time. Bennett, an outspoken feminist, also said she hopes movements like #MeToo and allegations — including those facing Hollywood film producer Harvey Weinstein and Toronto-based director Albert Schultz — will cause men to look hard at their past and present behaviours. "It is going to be important for people to take responsibility for what they might have thought was OK in another time but it is not OK anymore," Bennett said. "This is seriously a teachable moment." Last month, The Canadian Press conducted an anonymous, voluntary survey among current female MPs and found a majority of respondents — 58 per cent — said they had personally been the target of one or more forms of sexual misconduct in office, including inappropriate or unwanted remarks, gestures or text messages of a sexual nature. Thirty-eight of 89 female MPs chose to participate in the survey. The figures are unfortunately part and parcel of almost any institution where significant power differentials exist, whether it is the film business, sport or otherwise, Bennett said. "This is unfortunately a culture that has to change." Men on the Hill also need to acknowledge they play a key role in calling out inappropriate behaviour among colleagues, Bennett added — a view shared by former interim Conservative leader Rona Ambrose, Green Party Leader Elizabeth May and veteran NDP MP Nathan Cullen. "If people actually are seeing things that are inappropriate or would like to coach their colleagues, it is up to the guys to step up," Bennett said. "I think it is going to be really important." Earlier this month, Cullen said male MPs must help to usher in a culture change on the Hill and help snuff out sexual misconduct. The ecosystem of people who interact in and around the halls of power, including staff, lobbyists and parliamentarians, contributes to the blurring of professional and personal environments, Cullen said, noting he knows female MPs who boycott Hill-related receptions altogether due to fear of harassment. "They're sick of it," he said. The politically-charged nature of Parliament Hill was also flagged during the special committee's work, Bennett said, suggesting it can contribute to people being less careful with their words and how they interact with other MPs. "That becomes normalized," she said.